Be close with your Friends and Family by using Best Hindi Status . - You can direct share status with your Whatsapp contact list. - Moreover you can Copy the status and paste where ever you want. - More Than 2000 ever green statuses for Whatsapp and Facebook or other social network. 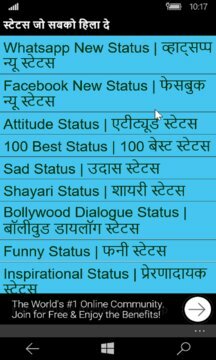 If you are looking for a nice, crazy, cool, funny or amazing status collection, your search ends in this Hindi Status app. Hindi status and quotes app is offline so there is no need of internet connection for it and user doesn't need to find on internet because various type of status are provided in it..!!! 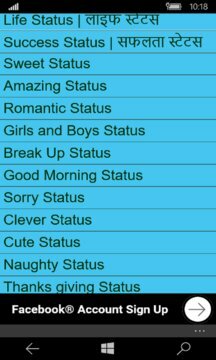 Latest collection of Best 2016 Hindi Status inside for those who love to set Best Status on Facebook and Whatsapp. Setting Good Status gets increased your likes on your post as well able to Show Your mood and Attitudes.